Metroid Fusion continues the tradition of 2D Metroid games on the Game Boy Advance after an 8-year absence. It was released more or less the same time as Retro Studios' 3D take on the series with Metroid Prime, and as a result was pushed out of the spotlight thanks to the critical success of Prime. Nevertheless, Metroid Fusion remains one of the surprisingly stronger staples, and one of the most original. 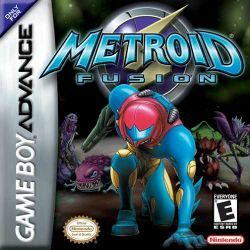 Metroid Fusion was created by Nintendo R&D 1, the same team responsible for the western success of Super Metroid. Nintendo first announced an unnamed Metroid title would be released for the Game Boy Advance on March 23, 2001. Developement was spear-headed by experienced Metroid series successor to Gunpei Yokio, Yoshio Sakamoto. Music was composed by Minako Hamano and Akira Fujiwara. Metroid Fusion was released December 16, 2011 to Nintendo 3DS Ambassadors. This page was last edited on 6 August 2017, at 01:07.